This is the first post in a new monthly Afropop blog series called RESPECT. The series is designed to feature the work of internationally under-appreciated African and Afro-diasporic artists from the distant- and not-so-distant past. These are artists who may have slipped through the cracks in your eardrums, and we would like to fix that. We will attempt to shed a bit of historical and editorial light on—or at least pay some special attention to—these artists, for no other reason than because their music is so immensely awesome. Feel free to send suggestions of your favorite under-appreciated artists to info@afropop.org for our consideration. Enjoy! 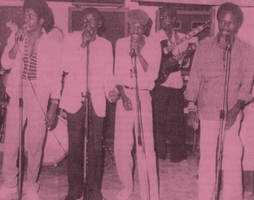 Formed in 1974 by singer Muzola Ngunga, the band is named after its economic patron and musical producer, Kiamwanga Mateta Verckys. Verkys was a saxophonist in Franco’s TP OK Jazz before he split off to form his own band, Orchestre Vévé. He also produced and recorded many lesser-known bands for his label Editions Vévé. By the end of the 1970s, the Orchestre Kiam had split up, although many of the members continued to perform with other successful groups including Zaïko Langa-Langa. Orchestre Kiam played a popular rhythm/dance called cavacha, which was a pre-soukous genre allegedly invented in 1973 by singer Eveloko Jocker in imitation of the dancing style of a local boufon. The song structures are mostly uniform: they start as a light rumba á la Franco, with the vocals in the foreground, before shifting into a lively rhythm that is clearly the antecedent of modern soukous/n’dombolo dance music. Once we arrive at the soukous section, it’s all pure beauty from here: overlapping and interlocking guitar, pitter-patter of snare drums, vooming bass. This second section usually features multiple guitar solos, but the most exciting moments are when the rhythm guitar and drums are given a duet, like in 'Baya Baya' and 'Yoyowe.' This music tends to inspire superlatives, so we will go ahead and say that these duet moments are some of the most rhythmically tight, body-and-soul-moving music ever to have been recorded. Although Orchestre Kiam is virtually unknown outside the memories of the now-advanced-in-age who experienced their hits in the ‘70s, and the tiny world of near-obsessive archivers and bloggers of ‘vintage’ African music, those who are aware of Kiam tend to use superlative phrases like, ‘Totally unique,’ ‘most underrated,’ and ‘best rhythm guitar players ever!’ Many of the comments on Youtube indicate that, during the 1970s, the band’s popular appeal stretched across West, Central, and East Africa. Amidst the reminiscences from les Zairois, mostly in French, are many from Kenyans. For example: "Don't know if u r kenya, but if u r, then I understand the kind of memories Kiam drowns you in. Kiam was more like your city neighbour; you may not know his or her name, but you recognise them instantaneously! Oh boy! did not our jaws drop open as the ladies wriggled their cylindrical areas to Kiam guitar stanzas, and our hormone-charged adolescent minds went into trips of fantasy?! Welcome!" “I have searched for this number for years. To me it always represented the apex of the golden age of Congolese music - especially in instrumental arrangement…I am glad that I grew up on a diet of this kind of music in Kariakor, Nairobi, Kenya. Well, what more can we say? RESPECT. Enjoy listening! Also, we strongly suggest that one of the many labels devoted to vintage African music remaster and re-issue this music! Lele N’sundi, Djuke, Sonora : Lead Guitars; Dezali, Morema: Rhythm Guitars. Judging from the recordings, there seem to be a total of only three guitars playing at a time. This personnel listing, gleaned from Mbokamosica and Geocities, probably implies all the members of the band over the course of its demi-decade history. Two drummers, Vechiko, and Adios Alemba are listed on the above-mentioned blogs, although one might be a percussionist.